Having outgrown this small building in just seven years, the Ward was busy constructing a much larger Chapel in 1932. By June, they were already holding services in the completed portion of the building. At this time, assigned members from the Boulder City Branch were sent to Las Vegas to see about securing the original building since they were meeting in a rented mortuary. The action was agreeable and the Branch purchased the building for $1,750. In order to move the building, large jacks were used to lift the Church and put it on timbers. This was all done by hand. Because of the size of the building, the solution was to saw the building in half, transport the building to Boulder City in two pieces, and then reassemble the building at the new location. The sawing of the roof, walls and floor was all done by hand with large saws, crowbars and hammers. When the first half was on the truck and ready to move, men had to sit on top of the building with thick gloves to keep the hanging overhead wires from hitting the building. The trip of 25 miles was slow going, but the first half arrived in Boulder City on June 29, 1932 in the morning. The second half arrived on July 1st. Many of the members made the drive to witness the historic event. Piecing the chapel back together involved a great deal of work and money, as did adding several rooms to the back of the building. All of this work was completed by the end of the month with the first Sacrament meeting being held on July 31, 1932. An opening social was also held, with an attendance of 200, including the Boulder Dam ‘Six Company’ officials, the Mayor, School Principal, and other government officials. By 1934, the Branch had paid off the debt to the Chapel and the building was ready to dedicate. The Stake President was uncomfortable asking Church President Heber J. Grant to attend the dedication, so Branch President Lawrence Wortley wrote a letter directly to Pres. Grant, who accepted. On the day of dedication, March 25, 1934, the building was packed with people standing in aisles and even hanging out the windows. President Grant sat on the stand in an overstuffed chair brought in from someones home. When a man walked in late, Pres. Grant asked the Branch President who it was. The answer was the Episcopal Bishop from across the street. Pres. Grant made a seat available for him on the stand and invited him to sit with him through the meeting. Several years later, on Feb. 20, 1937, the Chapel suffered a fire, and the same Episcopal Bishop provided his building to the Branch members to use during repairs. With work on the Hoover Dam completed by this time, many of the workers had recently been laid off and were able to help rebuild the Chapel. A unique feature in the building was a rope-actuated canvas roll-up curtain at the stage. This stage and hall doubled as the worship space and activity hall. On the curtain were many painted advertisements from the stores and businesses who had donated money for the curtain. Included were ads from Central Fruit Market, Vaughan Department store, The Emporium and the Green Hut Cafe. 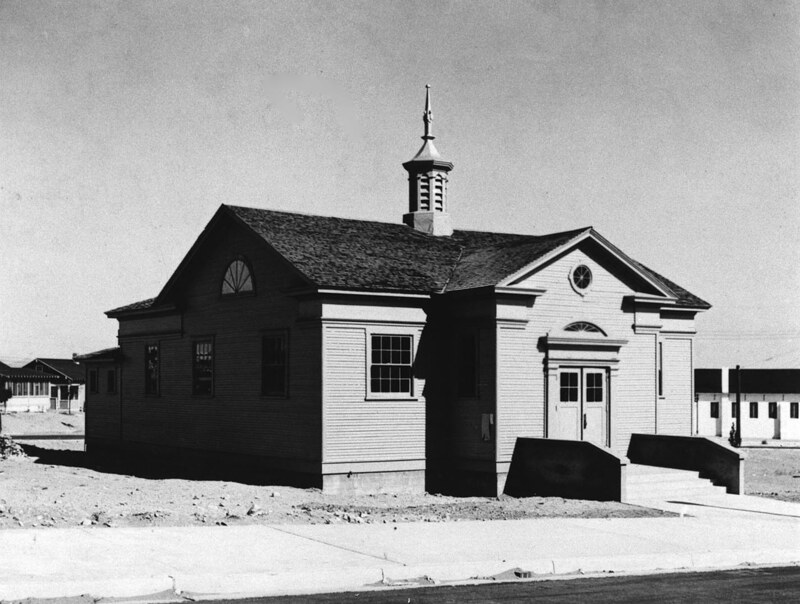 By the Fall of 1958, a new and larger meetinghouse was built and completed for Boulder City. 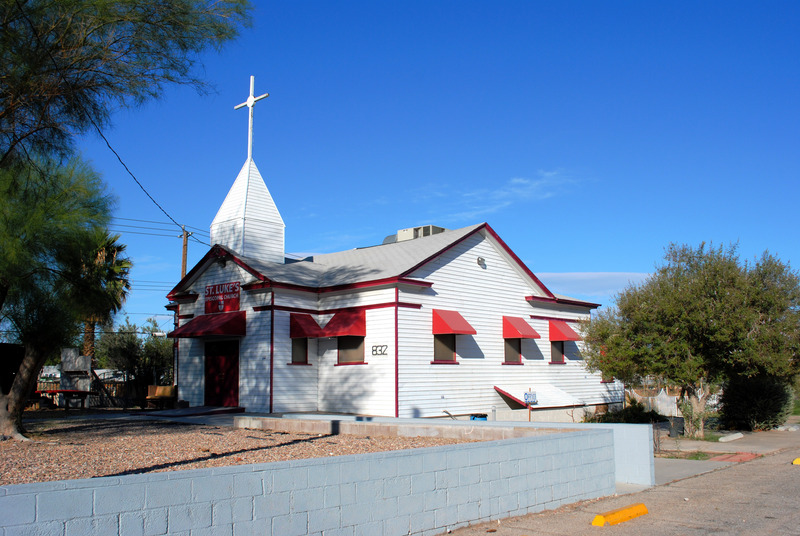 As a result, on February 15, 1960 the building was again sold; this time to a Protestant denomination who moved it back to Las Vegas at a site on 25th Avenue, now called Eastern Avenue. (According to Richard Jackson, the building was sold to St. Philip’s Catholic Church, who moved the building from Boulder City to Las Vegas.) Later the building would be used as a homeless shelter, and today is being used as an Episcopal Church. The photo above was taken in 2011 and, as you can see, the chapel is now hardly recognizable as the original building, with all the moving and changes over the years.